Gateway into Bali is an interactive, guided tour of GIS using this colorful Indonesian island as the backdrop. The application was created by Stereo Aids, an Australian based company. The learning level is aimed towards middle and high school students. Gateway into Bali uses MapInfo running in the background with a customized Internet Explorer as the interface. All the components that are needed are located on the installation CD-ROM. The installation is very straightforward and within 5 minutes I was up and running. 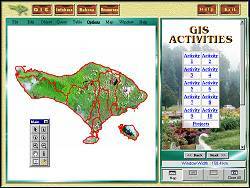 The program comes with pre-selected MapInfo databases that are used to illustrate the GIS concepts introduced in the lesson plans.In addition to the GIS module, the CD-ROM also contains “Infobase” which can be used to supplement the GIS program in order to create a well-rounded Geography lesson. As the students work with the layers in the lesson plans, they can enrich their knowledge base through the Infobase. As an added bonus, the third module is an introduction to the Indonesian language. Use this section to learn some basic phrases of Bahasa Indonesia. 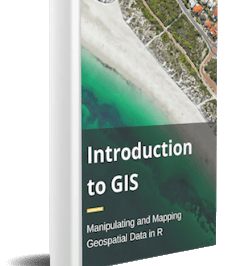 The GIS portion of this program contains 10 lessons as well as 5 supplemental projects at the end that take the student through more advanced GIS exercises. The lessons start out teaching the student very basic GIS concepts. Each successive lesson builds on the concepts taught previously. The entire lesson plan runs very smoothly and is carefully written to provide a solid basis in GIS. The early lessons acquaint the students with zooming, panning, scale issues and overlaying layers. As the students progress through the lesson plans, they learn how to work with attribute data and to perform spatial queries. They also learn how to use available datasets to derive other data layers. Data display is also reviewed and students learn about thematic layers and classification. Each lesson plan builds upon the previous one by reinforcing the newly learned concepts. For example, Activity Two provides a cursory overview of the concept of overlaying themes before progressing towards teaching the concept of queries and statistical calculations. This fortification ensures that the student has a keen grasp of all the functions so that the concept of GIS is truly learned.At the end of the lesson plan there are five suggested projects that allow the students to carry further the GIS concepts they have learned from the program. 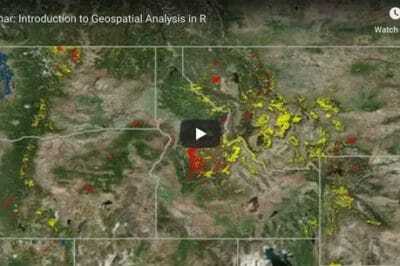 These projects provide launching points for further GIS practice. 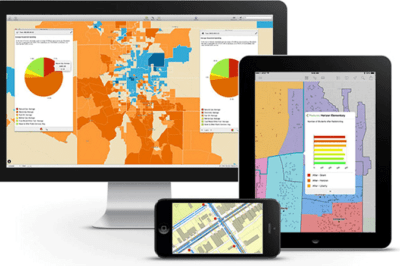 It provides the students the opportunity to use their newly founded knowledge to create independent GIS analysis. In the process of reviewing the program, I found that Gateway into Bali is a well-designed program that works equally well through teacher assistance or by student self-study. The application is well thought out and is realistically paced at the level of middle and high school students. This is a good starter kit for teachers looking to introduce GIS to their classrooms. The CD-ROM contains all the necessary applications and data so no extra software is needed. The minimum requirements (100 MHz, 16MB RAM, 65k colors) allow this application to function on most PCs running Windows (95/98 or NT) Operating software.